The Third Place LFP Knit/Book group already met their annual goal of 200 hats and scarves for those in need (see previous article) - but there's really no reason to stop knitting! The Third Place Knit and Book group meets regularly at a table in The Commons on the upper level of Town Center in Lake Forest Park. They knit or crochet while they discuss their chosen book of the month. 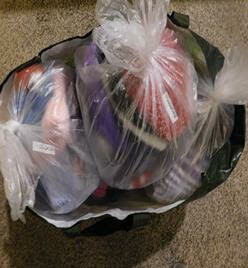 On Monday, they delivered 100 hats and scarves to Youth Care and Mary’s Place. If you know of a local organization that could use this assistance, contact the knitters.